Could a new party make it more likely that the Tories are re-elected? How can we ensure a new party does not go the way of the Labour Party? For the millions, not the millionaires! Unfortunately, the response of most of the trade union leaders to the Gate Gourmet struggle was not mass defiance but to limit themselves to arguing for changes in the law via the Labour Party. At the 2005 Labour Party conference, 99% of trade union votes supported the reinstatement of the right of trade unionists to take solidarity action and, as a result, the motion was passed. However, the democratic structures of the Labour Party have been destroyed and the conference no longer has any power. This, and other resolutions passed in opposition to the Blairistas, were immediately brushed aside by the party leadership. The �300 million of their members� money that trade unions have donated to the Labour Party since 1979 - �100 million of it since 1997 � might as well have been money burned. It does not buy a fiver�s worth of influence with the government. In fact, in its third term, New Labour is stepping up its attacks on the working class. Public services, particularly the NHS, housing and education, are being sold off at an unprecedented rate. Patricia Hewitt, health minister, has declared that "profit is not a dirty word", while she hands over our hospitals to the highest bidder. We are being told that we will have to work until we drop, with the raising of the state retirement pension age to 68. The occupation of Iraq has led to the deaths of thousands of Iraqis and over 2,000 �coalition� soldiers. Democratic rights are being undermined in the name of fighting terrorism. And New Labour has made it clear that, if it can get away with it, it will carry out a massive expansion of unsafe nuclear power. There are those who argue that it is possible to �reclaim� the Labour Party, and that this is preferable to setting up a new party to represent the working class. However we do not believe they will succeed. The chance to reclaim the Labour Party is long past and there is no point in continuing to fuel false hopes. The fact that a very few Labour ministers have found enough courage to timidly question some of these measures, particularly the education reforms, may be given as evidence of the possibility of shifting Labour back to the left. But this does not hold up. In reality, on this and other issues, the very limited opposition of backbenchers and occasionally ministers may have some effect on curbing the worst excesses of the government but is likely to be so timid that it simultaneously acts to legitimise the still extremely retrogressive policies that the backbenchers accept as a �compromise�. In education the drive towards privatisation and selection will continue, even if the current bill does not. This happened on internment (detaining people without charge). MPs opposed Blair�s demand to extend internment to 90 days, but accepted 28 days, which is still one of the longest periods allowed worldwide. Even more importantly, backbenchers have so far failed to use their positions in parliament to actually campaign against proposed government policy by mobilising ordinary people! Gordon Brown may become leader of the Labour Party, but he has made it clear that his leadership of the party will not represent a �shift to the left�. While the style may change, the substance of a Brown leadership would be basically the same as Blair�s. As Bob Crow, General Secretary of the RMT (Rail, Maritime & Transport union) put it, �same pie, different gravy�! Equally, all the potential leaders being floated in the event that New Labour attempts to �skip a generation� are arch-Blairites. We understand that, particularly if Brown becomes prime minister, many people will hope that the government will improve. But all the evidence is that things will carry on as before. The threat of mass strike action may have forced the government to retreat on pensions, but Brown wants to renege on the deal! And Brown�s opposition to the Turner Report on pensions � not because it is demanding we all work until we are 68 but because it promises to increase the state pension � sums up the reality of his approach. It would not take long for any hopes that Brown would represent a shift to the left to be shattered on the brutal reality of his neo-liberal policies, in other words, policies designed to do everything possible to boost the fat profits of the multinationals while driving down workers� living conditions and privatising and cutting our services. This is increasingly recognised even by those who cling to the hope that Labour can be reclaimed. "The most pressing issue is not the replacement of Tony Blair by Gordon Brown � they both represent much the same in policy � but the strengthening of pressure at all levels of the movement, from parliament to the rank-and-file branches of the trade unions and the party, for changes in policies. These changes are needed to replace so much of the Thatcherite heritage and values which still have influence in Britain and are perpetuated by so-called �New� Labour." Mortimer is mistaken in trying to spread the blame for New Labour�s perpetuation of Thatcherite polices across society as a whole. The millions who voted Labour in 1997 were hoping for change, not for a continuation of Tory policies. They have been bitterly disappointed. Only 11% of people in Britain support privatisation, yet New Labour just keeps selling off to a few fat cats public assets meant for the benefit of the whole population. "What the [Labour Party] conference voted for [in defiance of the leadership] - on NHS privatisation, workplace rights, pensions and council housing - has been shown in one opinion poll after another to be popular with the public." However, Willsman and Mortimer, along with others who share their views, offer no explanation of how it is possible to change New Labour. When most of the organised left was expelled from the labour party during the witch-hunts of the late 80s and early 90s, many on the left warned Mortimer and others that the process would end with socialist ideas being driven out of the Labour Party. Unfortunately, this has been proven correct. "I have taken from my party everything they thought they believed in. I have stripped them of their core beliefs. What keeps it together is power." Labour Party membership has halved since 1997 as disillusionment with the government has deepened. Some, like John McDonnell MP, chair of the Labour Representation Committee (LRC), argue that this will make it easier to "re-democratise the Labour Party and enable the rank and file to take control again". This was not the experience at the 2005 Labour Party conference. One in three constituencies did not bother to send a delegate to the conference at all. New Labour today is almost completely empty of working-class activists. It has to rely on paid telephone canvassers in elections because it does not have any activists apart from the paid officials and councillors who make up the machine. At the Labour Party conference the delegates� seating remained half empty while corporate sponsors were present in unprecedented numbers. Ministers addressed fringe meetings organised not by the trade unions but by big corporations. They included �Kyoto: Dead or Alive?� sponsored by oil giant Shell, and �Public Service Delivery� addressed by Hewitt and the arch-privateers Price Waterhouse Cooper. A majority of constituency delegates voted against all of the attempts of the unions to push Labour to the left. Where the government was defeated thanks to the union vote ministers immediately made it completely clear that the vote was as irrelevant to them as the lack of WMD in Iraq! Yet, such is the control-freakery of New Labour that, in the aftermath of the conference, Alan Johnson, former trade union leader and now a government minister, has called for a further cut in the vote of unions at the conference from the present 50% to 15%! 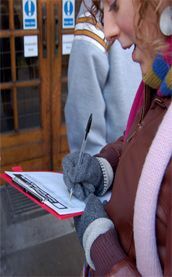 We believe that, without a major influx of workers into the Labour Party any campaign for rank-and-file control will be ineffective but, as the LRC discovered when it attempted to launch a recruitment drive in the anti-war movement, workers and young people entering struggle have no interest in joining the party they are fighting against. On the contrary, older trade unionists, who had been Labour Party members for decades, are leaving in disgust. The LRC itself has only 500 members.